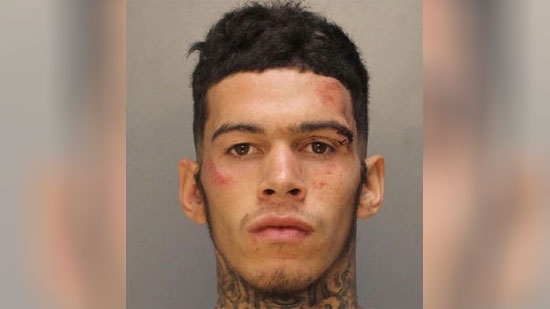 Philadelphia Police are conducting a manhunt for the getaway driver who escaped police custody following a shooting in North Philadelphia. The shooting took place before 7:30 p.m. on the 4000 block of L Street in Juniata. A 24-year-old man was shot in the chest. He was taken to the hospital and is in stable condition. At 7:45 p.m., Police stopped a car driven by 19-year-old Lamic Conde with the alleged shooter inside at 10th and Russell streets. They cuffed Conde and placed him in a cruiser. While they were arresting the shooter, Conde managed to get out of the car and run away with his cuffs still on. Police and K9 units tracked him to a nearby home on the 900 block of Russell Street. During their search, officials discovered a large scale heroin operation with guns, drugs, and cash. However, Conde was not there and is still on the loose. He is described as a Hispanic male, 5' 8”, 150 pounds. He has several tattoos including a red one above his right eye that says "Family." Two 16-year-old boys were shot and killed following an argument in South Philadelphia. It happened around 8:30 p.m. on the 2300 block of South 12th Street near Ritner Street. One of the victims was black and the other was white. Both teens were shot in the chest. They were taken to Jefferson University Hospital where they were pronounced dead. The shooter apparently fled the scene. No arrests have been made. Restoration work at Mount Carmel cemetery in Philadelphia's Wissinoming section has been completed. Last February, hundreds of tombstones were found toppled over and vandalized in the jewish cemetery at Frankford and Cheltenham Avenues. Through the hard work of volunteers as well as professionals all 275 toppled and/or damaged headstones were repaired and reset. The Jewish Federation of Philadelphia collected donations for the project and through the community's generocity they able to repair an additional 225 gravestones in the cemetery that had gone neglected over time. There still have not been any arrests in the case for the vandalism.